A contacts app for Nextcloud. 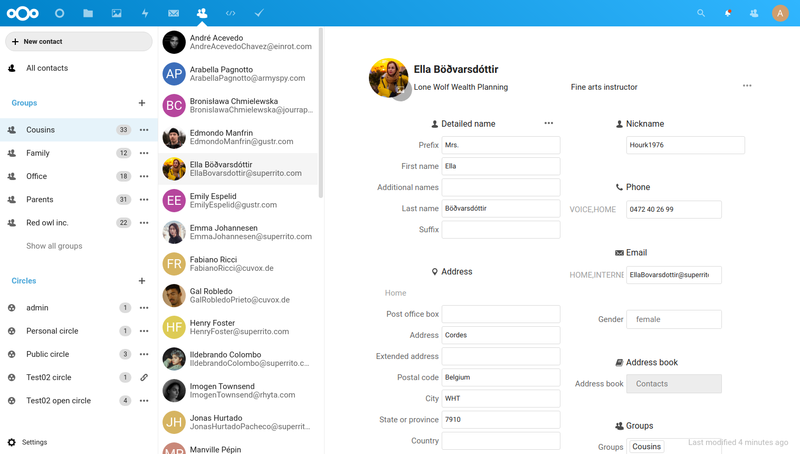 Easily sync contacts from various devices with your Nextcloud and edit them online. This app only support vCard 3.0 and 4.0. This app is compatible with the same browsers as server except IE! :blue_heart: :tada: Why is this so awesome? :rocket: Integration with other Nextcloud apps! Currently Mail and Calendar – more to come. :tada: Never forget a birthday! You can sync birthdays and other recurring events with your Nextcloud Calendar. :busts_in_silhouette: Sharing of address books! You want to share your contacts with your friends or coworkers? No problem! :see_no_evil: We’re not reinventing the wheel! Based on the great and open SabreDAV library. In your Nextcloud, simply navigate to “Apps”, choose the category “Organization”, find the Contacts app and enable it. Then open the Contacts app from the app menu. If you need assistance or want to ask a question about Contacts, you are welcome to ask for support in our Forums or the IRC-Channel. If you have found a bug, feel free to open a new Issue on GitHub. Keep in mind, that this repository only manages the frontend. If you find bugs or have problems with the CardDAV-Backend, you should ask the team at Nextcloud server for help! Navigate to »Apps«, choose the category »Productivity«, find the Contacts app and enable it.